Have you ever been to a familiar restaurant where one night all the different flavors on the plate seemed fresh and the whole dinner was a joyous voyage of discovery? Well, that’s what it was like musically at Kleinhans Music Hall on Friday morning for a three-work concert that will be offered again this Saturday night, October 13, at 8:00 p.m.
And, just as restaurants often have “pairings” of foods that complement one another, even if you don’t immediately see the connection, each of the three works on the JoAnn Falletta-conducted program had elements in common – moments of sweeping rapture, crystalline purity, and good old bat-out-of-hell energy. The concert opened with “Dark Mountains” by the Buffalo-born, 48-year-old Robert Paterson, a graduate of the Buffalo Academy for visual and Performing Arts, as well as Eastman, Indiana, and Cornell, who was inspired by living in Vermont, sometimes gazing out at the mountains and sometimes navigating twisty mountain roads at night. The piece sounded like movie music and talk about putting a scene right in front of your ears, you didn’t have to work very hard to get the feeling of being in the mountains, right down to the quiet as a woodland owl ending. The second half of the concert was given over to Rachmaninov’s 3rd and final symphony. Not as “popular” as its more famous sibling, the 2nd Symphony with the “Never Gonna Fall in Love Again” theme, this was only the fourth performance at Kleinhans (versus ten performances to date for the 2nd). Falletta loves Rachmaninov and his hyper-romanticism fused with a 20th century consciousness is right in her wheelhouse. The music of Ravel and Strauss and lesser-knowns such as Schmidt and Tyberg is the music she seems born to conduct. The acoustics at Kleinhans Music Hall are legendary and Falletta never let this “Rocky III” get mushy. Each musical treat stayed crisp and clear. But what I really wanted to hear was the Violin Concerto by 20th century American Samuel Barber and I am so glad that I was there. In my former career as full-time classical music host for WNED, I must have played this concerto on the air at least three dozen times. I thought I knew it. Hah! The way violinist Paul Huang played it and JoAnn Falletta conducted it was as if I’d never heard it before. It’s not your typical classical or romantic era violin concerto, where the soloist plays in contrast to the orchestra. It’s not your typical classical or romantic era violin concerto, where the soloist plays in contrast to the orchestra. Here, the soloist and the orchestra work together, and while of course the violin has beautiful moments, so do the clarinet (William Amsell) and oboe (Henry Ward). It’s a group hug, no doubt about it. But this Taiwan-born 20-something has a sound that you are not going to forget. Full Disclosure: He does have a “secret weapon.” As much as we all talk about Stradivarius violins, the violins that most Strad players secretly covet are the ones made by the maker whose imprint was “Guarneri del Gesu” with a bigger, fuller, darker, huskier, smokier, sexier sound than the Strads. 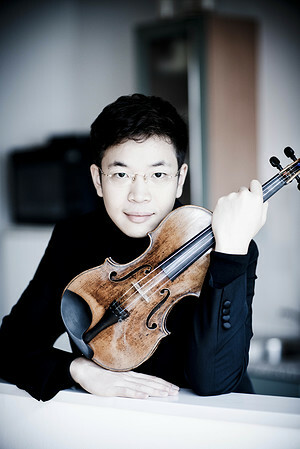 Huang plays on the 1742 ex-Wieniawski (a very famous 19th century Polish violin virtuoso) Guarneri del Gesù on loan through the generous efforts of the Stradivari Society of Chicago. If you’ve never heard a Guarneri del Gesu in the hands of a master, here’s a rare opportunity. By the way, you can hear a little of the Barber Concerto in Huang’s video biography. And you can hear his incredibly rich sound in this music by Sarasate. Unfortunately, despite raucous applause on the part of the audience and the orchestra too, there was no encore Friday morning. So, as I’ve written before, when you go tonight, keep clapping until you get that encore. Hopefully, it will be something from his CD, “Intimate Inspiration, a collection of favorite virtuoso and dramatic encore pieces” which is available at intermission in the Kleinhans lobby. When you go tonight, keep clapping until you get that encore.